Skincare is so important to me, I cannot go away on holiday or even just stay somewhere else whether it is a hotel or round a friends without my skincare routine it simply just doesn't get missed out from the equation. I have always been told to look after my skin and after all you do only get one face so you may as well treat it well. So this is my morning skincare routine and I will also share with you my evening skincare routine in another post. I always aim to have a good base so my skin is prepped for my makeup. My skin is oily/combination so to start with every morning I will grab my trusty No7 Beautiful Skin Cleansing Brush which I have had for about 4-5 years now. It has 2 power setting but I always stick to the first speed as I find it's not too harsh on my skin. So of course I need to wash my face and combat the oil so I have been using the Witch Naturally Clear Exfoliating Face Wash in which I place some on the bristles and apply to my face whilst it is wet and just simply start scrubbing gently away. This is my favourite step as my skin feels so smooth and it definitely is keeping my skin clear and spots at bay. Next a step I also cannot live without, I have been using this product religiously for the last year which is the Lush Tea Tree Water, this also plays a huge part in keeping my skin clear due to it's antibacterial properties. I simply spritz this all over my face and with a cotton pad I wipe away any excess. Now moisturiser, this has been new to my routine since April and I do have a separate post on it which you can read here and it is definitely going to stay as it is perfect for those with oily skin. I have found that I don't get shiny around my T-Zone when I use this product and I feel like it has still moisturised my skin unlike other moisturisers for oily skin, they tend to make the skin feel too tight and dry. Finally an eye cream, now I am not too keyed up with eye creams but I feel that this does the job in banishing any puffiness around my eyes and they look far more awake which is exactly what I need in the mornings! So that concludes my morning skincare routine which I am very committed to! Do you use any of these products? 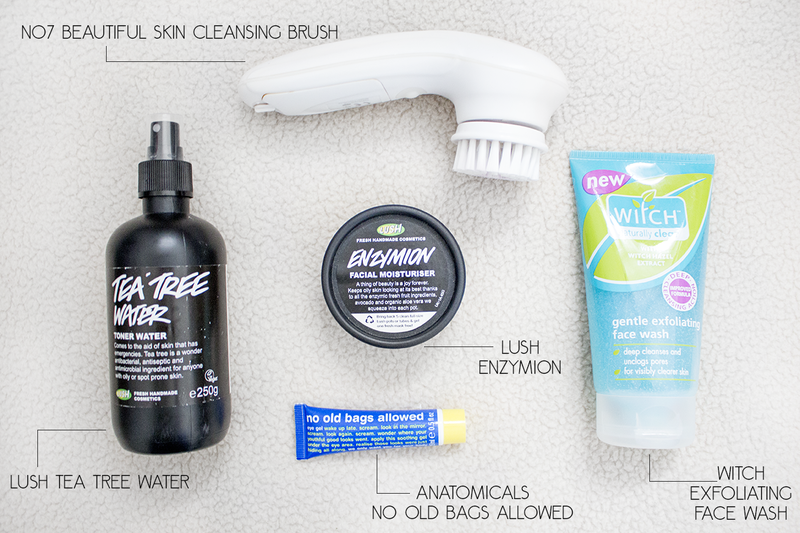 The No7 cleansing brush sounds amazing!